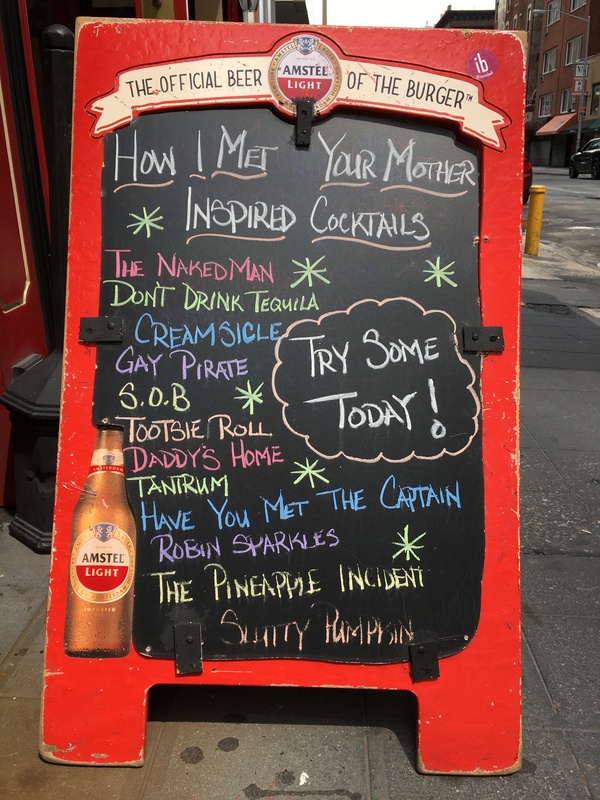 This cleverly-name-drink menu was spotted outside McGee’s Pub, the bar that served as the inspiration for McLaren’s Pub on the hit TV series How I Met Your Mother. I wonder if they also host a Trivia Night? 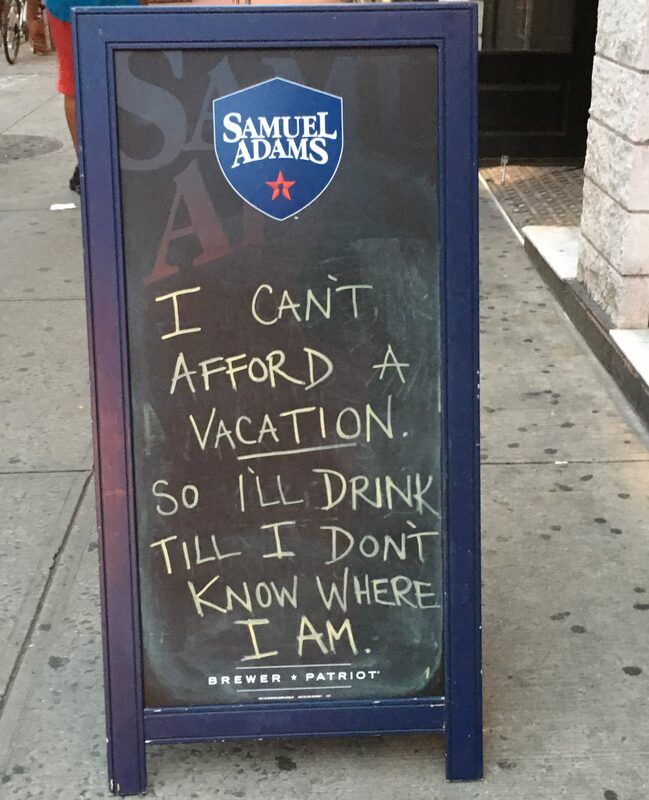 McGee’s Pub and Restaurant is Located at 240 West 55th Street (Between Broadway and 8th Avenues) in Midtown Manhattan. The choice corner lot that formerly housed Tiny Fork Oyster Bar (RIP) is now home to a bright and casual Southern-Inspired bar and dining hall called The Derby. While this lower east side neighborhood has its share of up-and-coming eateries boasting a farm-to-table ethic, as far as location goes, you probably couldn’t ask for a better spot to enjoy an early summer evening dinner. Weather permitting, the front room keeps the doors and windows open to the street while the rear dining area remains flooded with natural light from its east-facing span of tall windows. 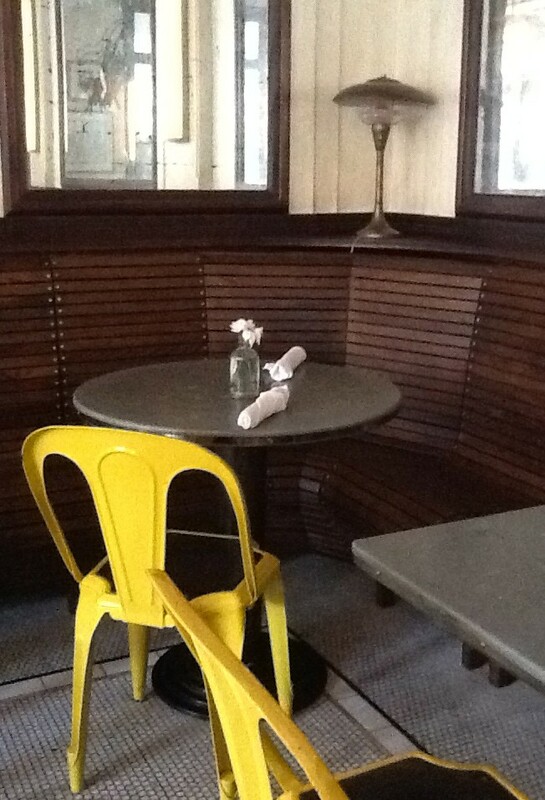 The vibrant yellow-painted metal chairs, dark wood tables and antique bistro lighting (possibly left over from the space’s previous incarnation) add to The Derby’s welcoming vibe. Of course, the people watching is excellent. 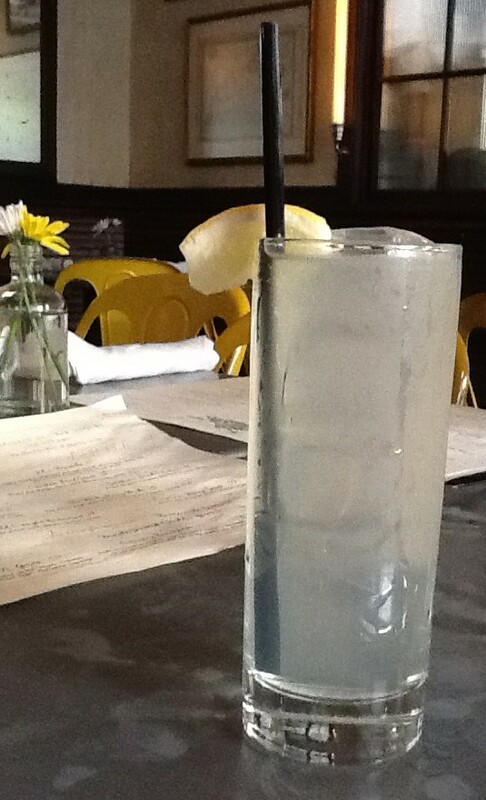 We started off a recent visit with a tall, refreshing Vodka Lemonade, but if you are a Whiskey fan, The Derby has an excellent selection of unique choices to enjoy in one of their house specialty cocktails or on its own. As a starter, we shared the BBQ Brisket Tacos ($12), stuffed with tender and flavorful dry rubbed meat, pickled onions and cabbage slaw and served with side of horseradish cream for topping them off. The crispy corn taco shells add a satisfying crunch to the appealing mix of textures going on in this great little plate. 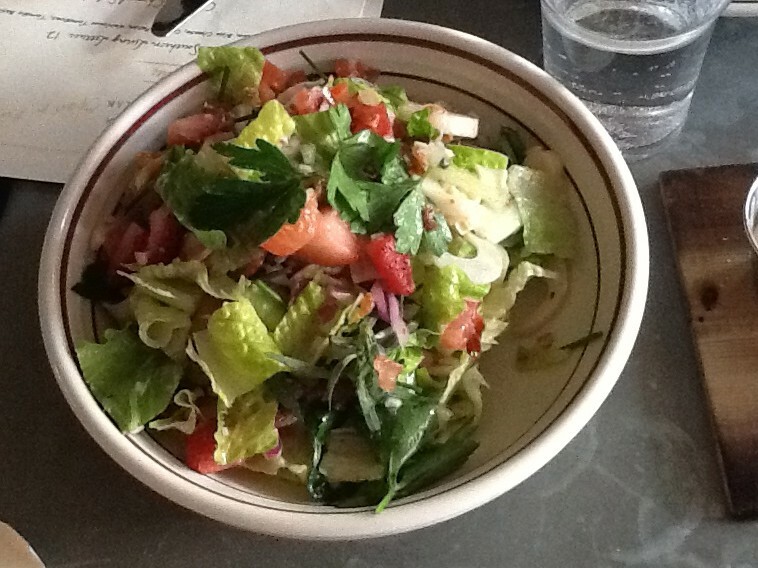 We also shared the Carolina Chopped Salad ($12), featuring crisp romaine and a mix of delightfully diverse ingredients including hearts of palm, fresh sliced strawberries, pancetta, and abundant fresh herbs, dressed with a shallot-thyme vinaigrette. Salad offerings also include the Southern Living Lettuce Salad ($12) where bacon lardon, blue cheese and candied pecans steal the show! 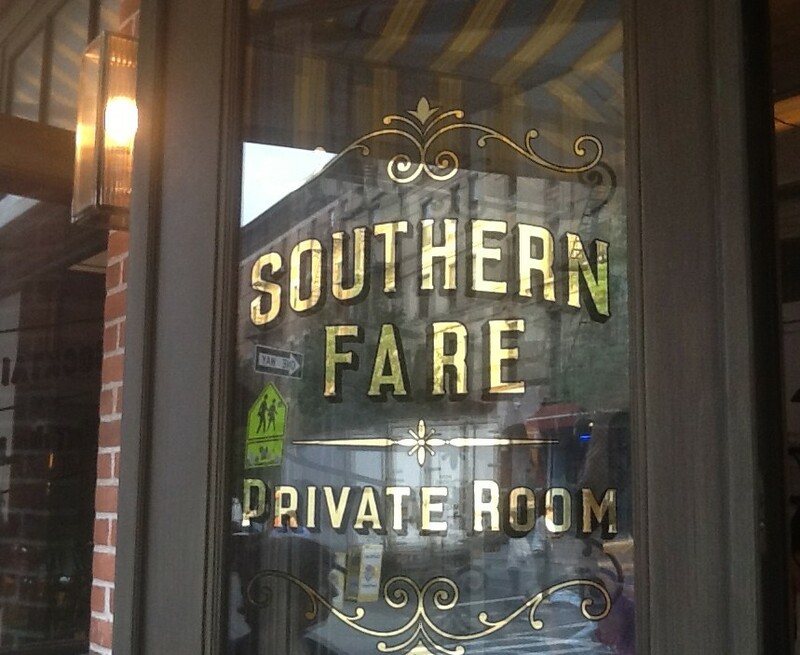 Two house specialties at The Derby include their excellent Southern Fried Chicken entree ($16) and a Breakfast All Day dedicated menu section that includes three hearty Southern brunch entrees. 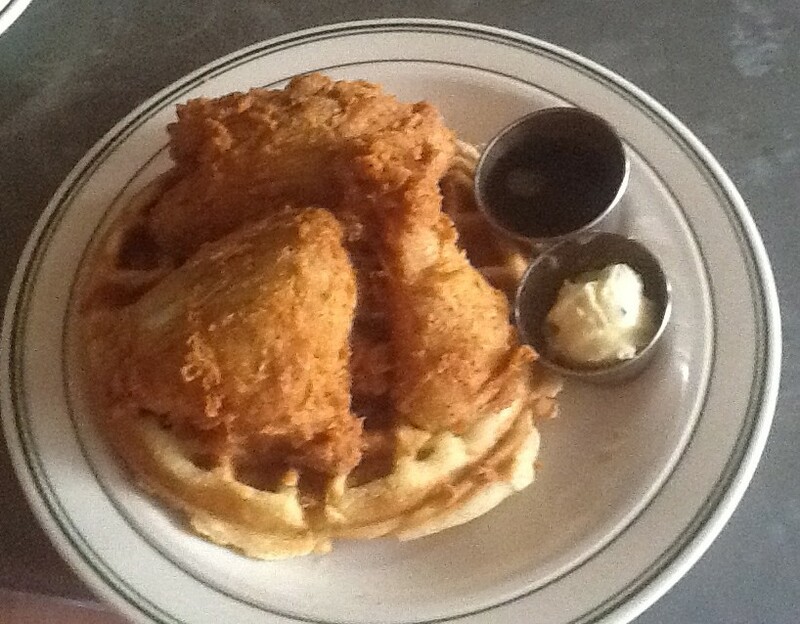 We opted to enjoy a bit of both worlds with the Chicken and Waffles ($18) which did not disappoint! 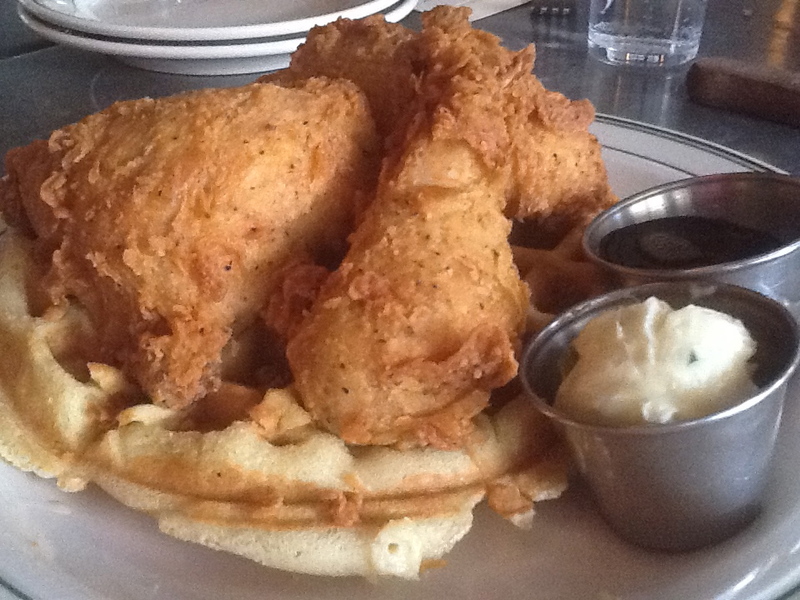 Loaded with three plump pieces of juicy chicken and a plate-sized waffle, this is a hearty entree that you could easily share. 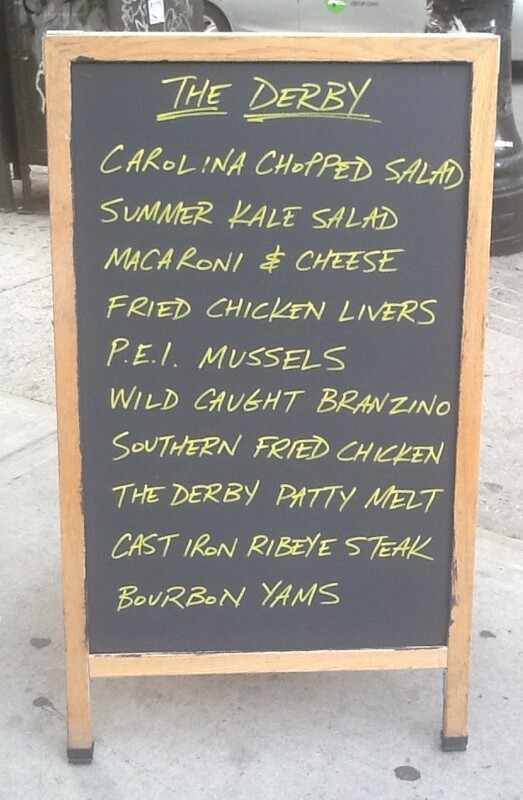 Fried Chicken has become a bit of a Thing in NYC recently, but this is exceptional. Having grown up with Southern grandmother who made the best skin-free fried chicken on the planet, I’d swear that The Derby’s is just as good (sorry, Grandma). Here’s another “Elevation Shot” of that awesome Chicken, where you can see the herbs and seasonings in the light, crispy batter. 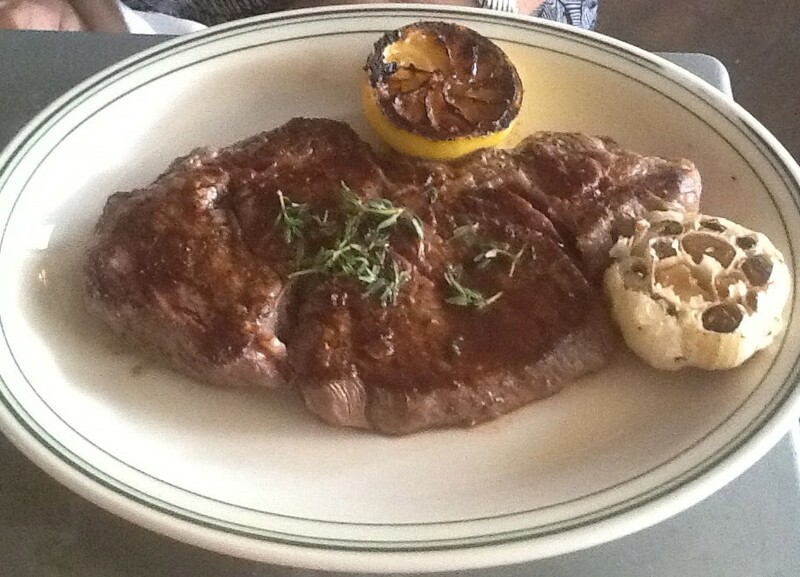 My dining companion indulged in the Cast Iron Ribeye Steak ($32), a huge slab of perfectly marbled, grass-fed beef served with an oven roasted garlic bulb! Marbling is what makes the Ribeye cut taste so special, but sometimes it can be a bit excessively fatty. This steak was expertly trimmed and, trust me, she ate every succulent, well-seasoned bite. This dish is very highly recommended for steak fans — it even surpasses the Ribeye we enjoyed at The Black Tree (just up the block) a week earlier. Round out your entree with a variety of fresh made sides (all $6) such as the Maple Smoked Cheddar Grits, Bourbon Yams or Yukon Mashed Potatoes. A daily choice of fresh Market Vegetable ls also offered. We were actually too full to order dessert (which almost never happens) so we will have to make a return trip to The Derby for that. 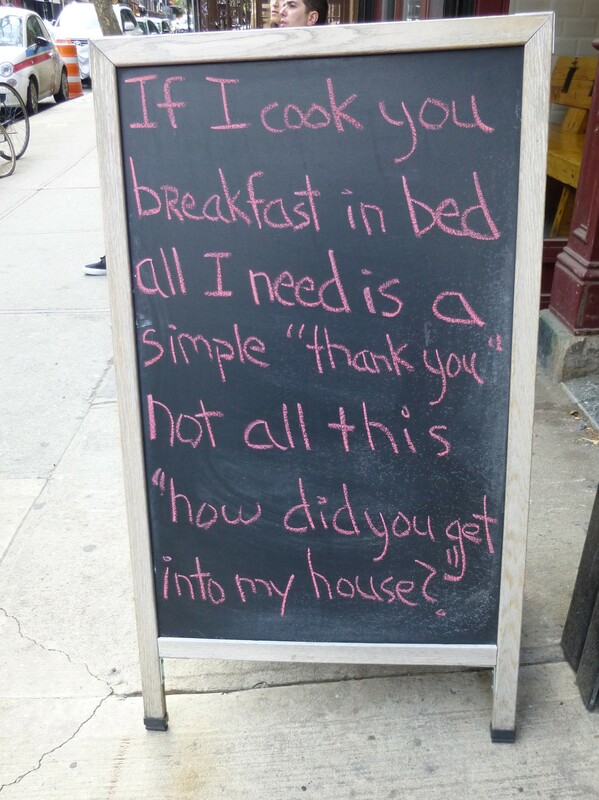 You can see by the above Chalkboard Menu on display out front that there are many other tempting dishes left try. The Derby is Located at 167 Orchard Street (South West Corner at Stanton Street). Hours are Monday – Friday 4:00 PM -11:30 PM and Saturday – Sunday 12:00 Noon-11:30 PM. 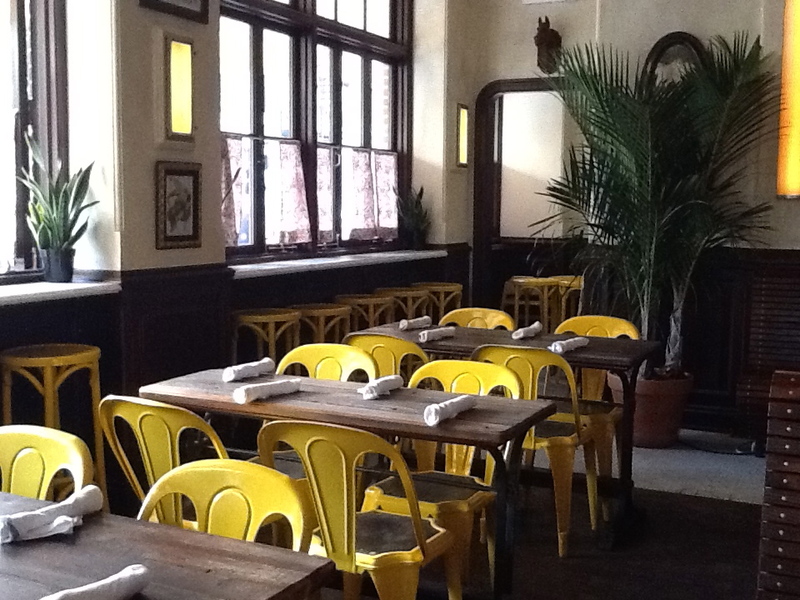 Phone 212-777-8469 for Reservations. Photographed by me on East 5th Street between 1st and 2nd Avenue, NYC.